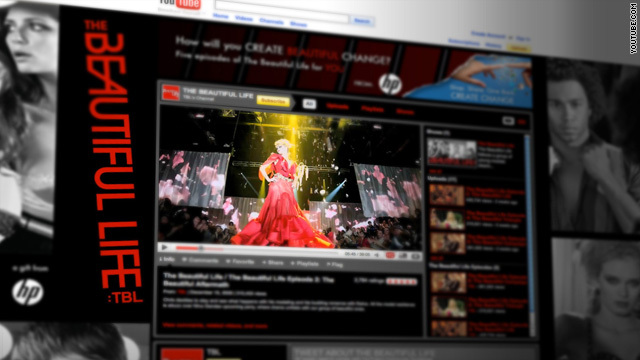 "The Beautiful Life" is finding the success on YouTube which eluded it on broadcast television. (CNN) -- It was a show about beautiful people with some ugly ratings. The Ashton Kutcher-produced CW drama "The Beautiful Life" only survived on television last fall for two episodes. Now the show is getting a second and more successful life online, and that could ultimately lead to the creation of new episodes. Five episodes of the series, including three that never aired on television, were posted on YouTube in mid-December and are showing strong numbers. The first episode received more than a half million views, and subsequent episodes are gaining on it. Half a million was the goal Kutcher set for the series when he made the executive decision to put it online. "If we put this thing on the Web more than half a million people will watch it on the Web," Kutcher said in a video message posted on YouTube last month. "I want this to be the first show ever that gets more viewers on the Web than it did on terrestrial television." The five episodes combined have been viewed about 2.7 million times in the three weeks they have been available online in their entirety. The New York City drama about the underbelly of the modeling world pulled in 1.5 million viewers on the CW for its premiere episode and 1 million for the second episode. "Like everything on television, you've got to get a certain viewership to be viable, and the ratings just weren't there," said Andrew Wallenstein, the editor of digital media for The Hollywood Reporter. Kutcher explained the poor television ratings by claiming that no one knew the show was on, despite a big media push the series got over the summer from several scandals involving star Mischa Barton. "Here's what happened, we put the show on TV and it ran for two episodes. Nobody knew it was on, so the rating on the TV wasn't happening," Kutcher said in his YouTube video post. After the show was cancelled, Kutcher's production company Katalyst Films approached YouTube about airing full episodes online. "We were impressed by the show's passionate following, despite the fact that only two episodes had aired on TV. We collectively agreed that we could breathe new life into the series by premiering it on YouTube," said George Strompolos, YouTube's strategic partnership manager. Electronics company Hewlett-Packard stepped in as a sponsor for the show, partnering with "The Beautiful Life," on its "Create Change" philanthropic program. As part of the arrangement, the show's stars Elle Macpherson, Corbin Bleu, Barton and Sara Paxton recorded video commentary for YouTube about how they will create positive change in the next year. Barton said she wanted to get her two dogs registered as therapy dogs. Paxton said she would become a vegetarian and replace her Range Rover with a hybrid vehicle. YouTube users could upload their own videos about their personal goals. HP's plan is for the videos and the message to go viral. "The Beautiful Life" is scheduled to run for six months on YouTube and Strompolos says that so far the numbers are a good indicator that its popularity will continue to grow. "It's important to keep in mind that online audiences watch when they want to watch, so this content will continue accumulating views during its six-month run," Strompolos said. "These videos are clearly much different than the two-minute viral clips that spread like wildfire across the Web. For an original long-form scripted drama being distributed online, this performance is very strong." Watching the show die a sudden death was tough on the up-and-coming cast members who are happy the taped episodes won't be collecting dust on a shelf somewhere. "It's pretty exciting for our friends and family to be able to watch the episodes that never aired," said Paxton, who plays the show's female lead Raina Collins, a beautiful girl with a secret past. "After it was cancelled, a lot of fans were reaching out on Facebook and Twitter and asking where they could see the rest of the episodes. Now that it lives on the Internet, who knows what it will turn into. I don't know what to expect out of it." Katalyst's original expectation for the move online was to provide closure for the show's creators, stars and writers, but now that the online success has mounted, Kutcher and his partner Karey Burke are considering various options for keeping the show alive. "Now that the airing of the episodes on YouTube has been as successful as it has been, there are conversations about continuing with the show in some form or fashion. We haven't had any discussions with the CW about bringing the show back, but anything is possible," Burke said. "There certainly could be a short form version of the show that could live on the Web if our studio partners were interested in that and enough of the cast were interested." While YouTube hosts a vast amount of old television shows and original Web series, this is the first time a cancelled television series from the United States has moved onto the platform and is as much an experiment for YouTube as it is for Kutcher. Beyond bringing new eyeballs to the already created episodes of "The Beautiful Life," posting the show on YouTube is an invaluable investment in data gathering for Kutcher and Katalyst. YouTube is able to collect information about the people who tune into the online episodes, including gender, age and what scenes a viewer engaged with the most. The data can inform the choices that Kutcher and Burke as producers make with future projects. "It helps the content producer learn what matters most to their fan base," said YouTube spokesman Chris Dale. "That kind of data is hugely valuable and helps make a better product in the long term."